The Canon Expo 2010 took place this past September 2 through September 3rd at the Jacob K. Javits Convention Center in New York City. The Canon Expo happens every five years, and it is an exhibition that gathers business partners, Canon customers, and industry professional. The exhibition is an experience like no other, and it gives the rare chance to take a look at all Canon products under one roof. My impression of the exhibition was of pure awe with Canon display of products that vary from the most known Photography, Video, Projection, Broadcasting, and Printing lines to Healthcare, security and business solutions. Attendees were able to see a lineup of all Canon products classified in different pavilions. As a photographer and director, we spent most of our time at the photography and video pavilions. The Photography exhibit took you from start to finish of the photography process, from taking a photo, transmitting it wirelessly to your computer, where it could be manipulated, and then printed all in a matter of less than 5 minutes. 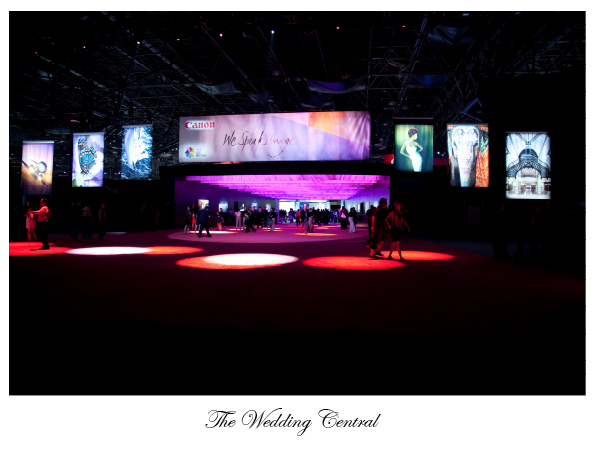 A great treat was a runway built for attendees to view and test all canon cameras and lenses. Every half an hour, four models would walk the runway, and you were able to experience being a fashion photographer for ten minutes by trying any of the Canon cameras and lenses set up. I was tried the 85mm 1.2, and I found it great, slow to focus, but with sharp images. At the end of the runway show, we were allowed to take home a 2GB CF card what was inside the cameras we were using with all the pictures we took. Thank you Canon. Theoretically, you could have tested every single lens being made by Canon, but I would have missed the great seminars they had put together. Continuing our trip, we headed to the Video Pavilion, where I must say, I was not truly impressed. Well, partly impressed. The first products you saw as you walked in were video cameras that looked like a reminder of old products and of how video cameras used to be, more or less like when you see first a generation iMac at MoMA, with the difference that you look at the image produced by these cameras and wonder how in the world could I have liked that image? But then, you are reminded by promoters that these are products being manufactured and sold by Canon, today. There was concept futuristic video camera that looked more like a still camera, but with a viewfinder capable of letting you see what you are actually recording, with the clear difference that my Canon 5D produces better Video. It truly felt like the Photography and Video Department don’t talk to each other. But then, thankfully, we got the chance to see something amazing, 4K prototype screens, and they have an image quality unlike anything I had ever seen. The image is crisp regardless of how close you get, and you cannot stop wondering where is technology heading, and what surprises await. Once those screens are out, getting a plastic surgery will be like going to the dentist, mandatory. There was also a live demonstration of 3D. Two cameras recorded video that was projected simultaneously by two separate projectors giving you 3D. Above all, what truly captivated me was Canon Seminar Lineup. Canon talent coordinator brought an amazing group of professional cinematographers, filmmakers and photographers who were there to speak about their knowledge and experience with Canon products. Their presentations opened up a window of possibilities to what we as artist can do. Runway for Still Camera testing and Ice Ring for DSLR Testing.